Does your business or organization need lead collection boxes for marketing or charitable giving programs? Fundraising containers are some of the easiest to use and most economical commercial accessories. 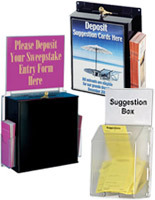 Countertop lead collection boxes for contest entries or business cards promote business development at trade shows and in-store promotional events. 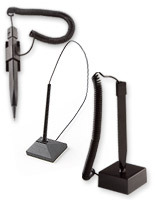 Many operations use this type of fixture to collect suggestions, ballots, or employee feedback. 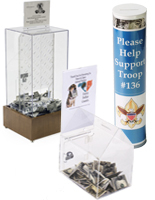 High visibility lead collection boxes are ideal donation or fundraising containers for charitable giving campaigns. 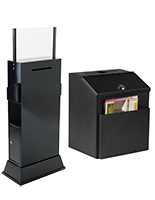 Displays2go sells floor, counter, and wall-mount collecting bins in a wide variety of materials and designs. In-stock styles accommodate the needs of both for-profit and non-profit businesses and organizations. Lightweight portable models are great choices for ongoing outreach as well as special event or emergency funding. School, church or civic groups might prefer economy clear acrylic donation cans while car dealerships and hotels may need locking metal key drop stations. Whatever the use, these versatile slotted containers are a great way for any operation to reach out or give back. What are the most popular fundraising container styles? Countertop lead collection boxes for business cards or contest entries are designed to attract sales prospects or encourage giving. High visibility, easy to change headers and branding signage make lightweight acrylic or cardboard fixtures ideal for use as in-store counter accessories or at off-site promotional events like trade shows. Construction can feature clear plastic or opaque materials depending on the level of security desired. Wooden collection boxes have a traditional look that complements even the most professional environments. Sturdy construction provides increased stability for storing votes, offerings, and tithing donations safely out of sight. Integrated pockets keep entry forms or blank ballots organized but accessible. Many styles feature locking mechanisms for security. Built-in sign holders help showcase messaging and branding in public environments. Lightweight cardboard entry bins are a cost-effective way to bring game-style contests, raffles, or ongoing charitable giving into any location. Corrugated paper construction is sturdy enough for counter and freestanding container models. 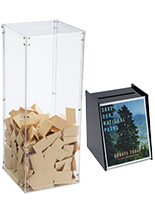 This type of box bank is a great choice for groups, schools, teams, and organizations to place at local businesses and events to encourage donations to local causes, campaigns, shelters, or programs. 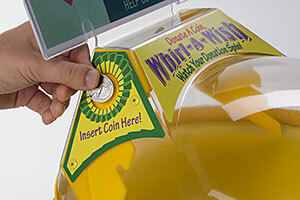 Slotted donation cans are one of the simplest and most effective fixtures for off-site fundraising. Cardboard charity collection boxes with sign holders allow branded school, college, university, or civic giving drives. Fundraising collectors for coins, checks, or paper money often include locks that secure contents. Many non-profit organizations such as churches and hospitals choose wood or metal coin containers for privacy. 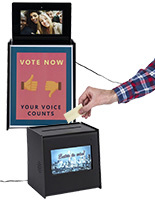 Locking drop boxes that hide contents are the best choice for secure and private voting, suggestion, or feedback stations. Our metal containers offer a variety of options for branding, cause identification, or advertising. 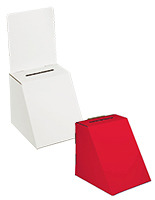 Sturdy aluminum or steel donation collectors are ideal for organization or school elections. 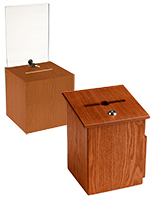 Secure ballot boxes can be used as key drop stations, and come in freestanding, pedestal, wall mount, and countertop designs. Slotted containers are used to collect feedback, donations, or information. Comments, suggestions, and surveys are great ways for businesses to monitor operations and morale. Schools, teams, clubs, and other organizations use elections to align leadership and representation. 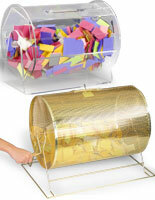 Employee appreciation events such as raffles or contests are popular in any industry. Collecting and storing comment cards, election ballots, and staff suggestions calls for varying levels of privacy and security. Clear plastic or opaque construction, locking or open-access designs, and high visibility signage allow this type of drop box to meet any needs. Fundraising and donation cans help schools, clubs, churches, and other organizations raise money for charitable causes. Religious tithing, “penny drives,” and emergency assistance programs are some of the many uses for this type of social giving campaign accessory. Inexpensive cardboard fundraising blank collectors with headers for branding, graphics, or logos attract attention to messaging on countertops or reception desks. Clear acrylic construction combines full visibility with light weight for portable use off-site. Attracting sales prospects or potential customers is one of the top uses for fundraising containers. Easy labeling options for logos and graphics increase brand recognition at high traffic trade shows and promotional events. Simple slotted designs support business card drops and raffle entries. 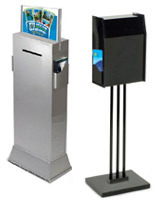 Game-style money drop fixtures create excitement by encouraging people to play in exchange for contact information. 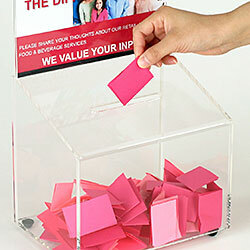 Many businesses and vendors use drop boxes to maximize visibility and engagement. Our wide selection of in-stock collection accessories is carefully curated to meet the needs, and budgets, of any company or customer.